Earlier I talked briefly about the Welcome message — the first message subscribers get once they subscribe to your list. Let’s go into a little more detail about what should be in it. 1) A thank-you is a great start: they just gave you access to their inbox. That’s a big deal. 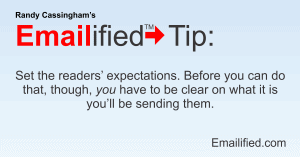 2) Remind them what they’ll get in the messages to come: set the readers’ expectations. Before you can do that, though, you have to be clear on what it is you’ll be sending them. A newsletter? Will it be the full content, right there in the email? (Example of that: my This is True newsletter.) Or will it be a brief teaser, and they have to click to get the “real” content? (Example of that: the Emailified newsletter.) And how often should they expect a message from you? Know what you’ll be sending and make that clear, right in the Welcome message. Yes, you should start that process when you ask for their subscription in the first place, but you’ll reinforce it here, and add detail if necessary. 3) Deliver on any promised incentives right here, right now. Which is to say, did you promise a report, whitepaper, bonus, or other “incentive” to the reader for signing up? Either deliver the information in the message or (more likely) tell them exactly how they can get it right now with little effort (such as a download link). 4) Include contact info — at the very least, a link to your web site. That can be part of the footer, which should include your name (and/or your company name), and a real postal address (as required by federal law in the U.S. and many other countries). 5) Keep it all fairly short: save the detail for follow-up messages or pages on your web site. Creating this welcome message should be part of your list setup at your ESP — it’s something you need to create and set up so that each new subscriber gets it the moment they confirm. It not only sets their expectations, but reminds them that yes, they asked for you to communicate with them. Don’t blow this huge opportunity! Your Subscription to Emailified Briefs is all set: thanks for signing up. You can expect one brief message per week with updates on the Emailified site — almost always a new article with tactics, best practices, or other tips that is slanted toward the entrepreneur, or small non-profit. Since Emailified is free (there isn’t even advertising on the site), I don’t have much of a budget for promotion, so I would greatly appreciate your helping to spread the word a little: tell other entrepreneurs about the site, post links to articles that you find particularly interesting, or forward your newsletter to anyone you think would benefit with the suggestion that they subscribe too. Thanks! Being new here, you have already missed quite a few articles. You can find a complete list here. Some of the best articles started with a reader question, so don’t hesitate to ask if you have one. There’s a contact form on the web site, or you can simply reply to any Emailified Brief — yes, the replies come directly to me, and I do read them. In fact, I have a question for you: What’s your biggest pain or fear when it comes to email lists? Again, you can just hit Reply and let me know. I just might turn the answer into an article. Short and to the point (and the mailing address is added automatically to the footer by the ESP). It’s not rocket science, just clear and concise communication. Oh, and by the way: did you reply to the question in the Welcome message? If not, you can reply to your Emailified newsletter to do so, use the Contact form on the site (see menu), or put a comment in below. And thanks: I really do want to know your answer!